Home is where we park. 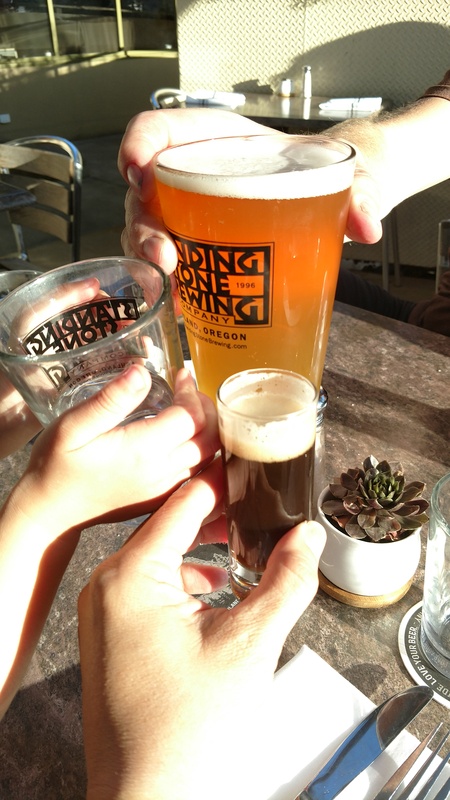 2 adults plus toddler. 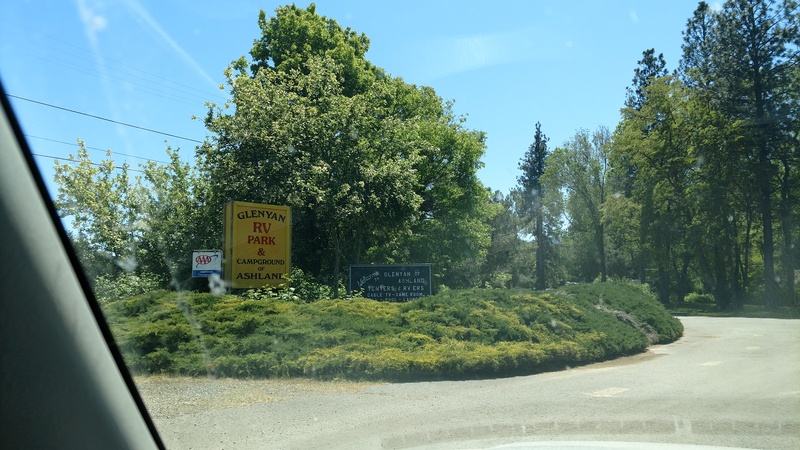 Our arrival into Oregon Territory and Glenyan RV Park in Ashland! 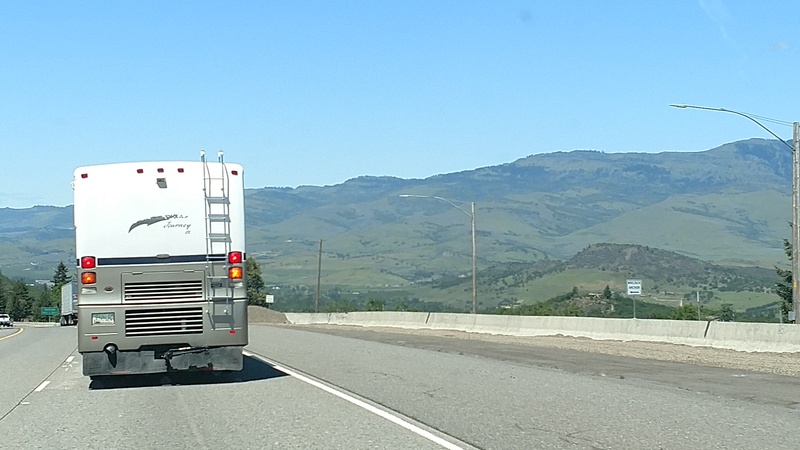 I think it’s safe to say we were all really happy to leave Redding. 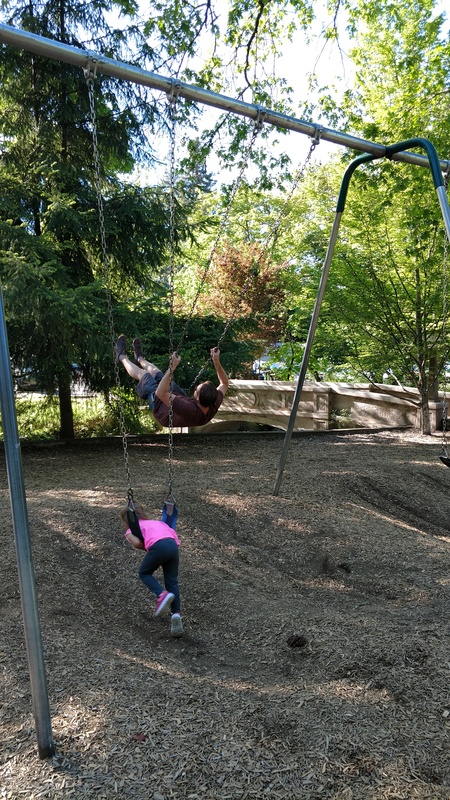 Although we got to spend one amazing day they’re due to some technical issues we were excited to get back to Oregon or Scott and I had originally met. 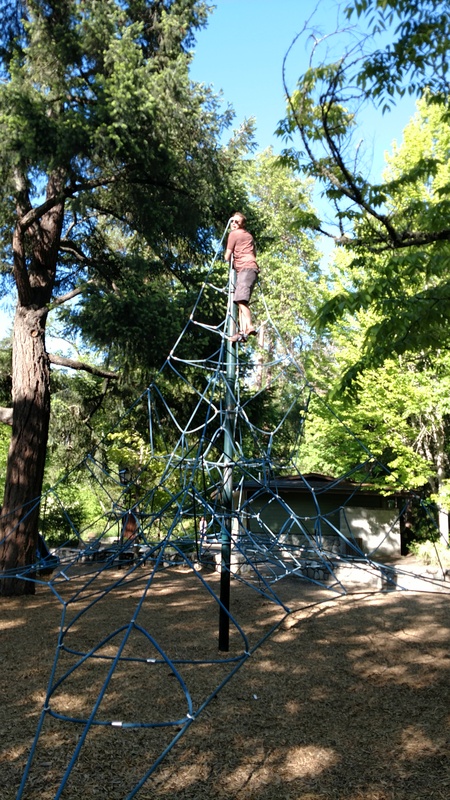 On our one-day of downtime and Redding we did get to do something really cool I wanted to mention. 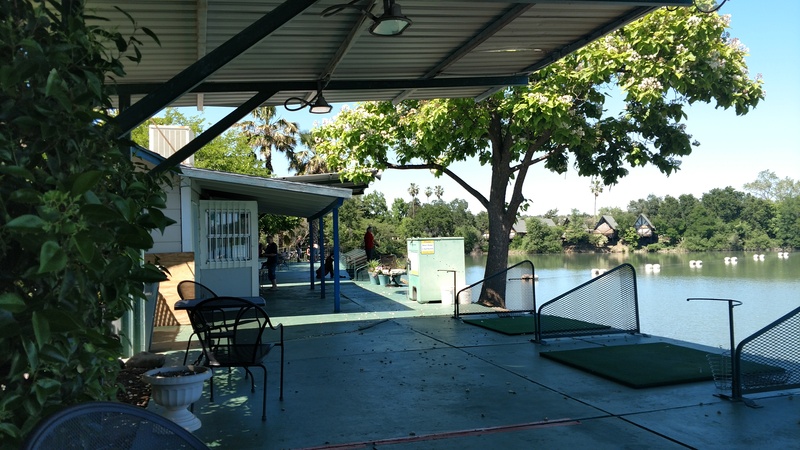 They have a driving range where you hit floating golf balls into the Sacramento River. 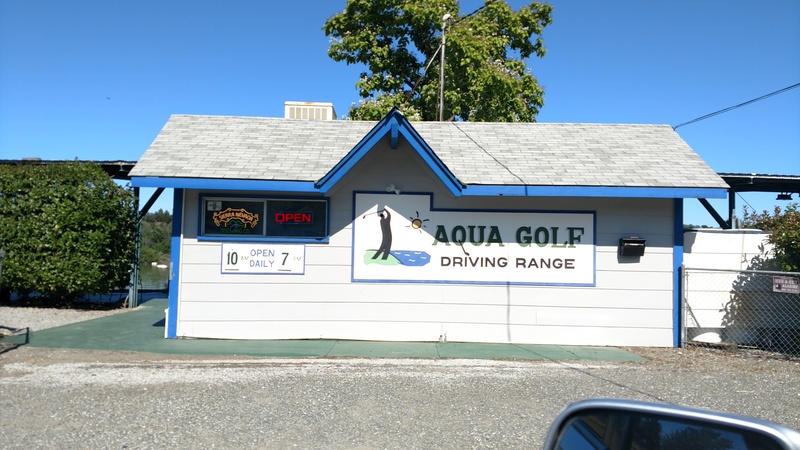 Aqua golf driving range. 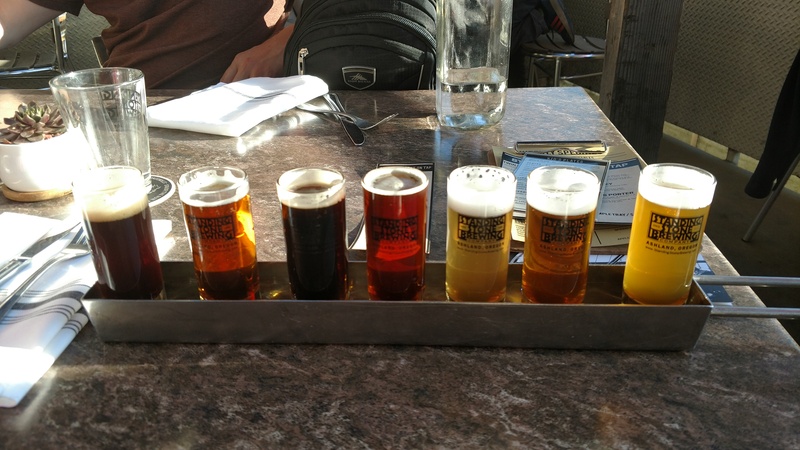 They also sold really good cheap beers and had free kids club rentals. 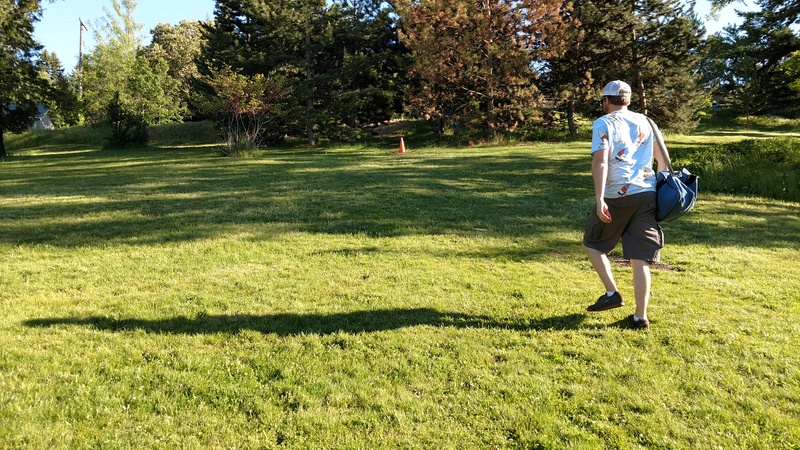 We ended up paying for a bucket of balls several times and rented two clubs that a dollar each. 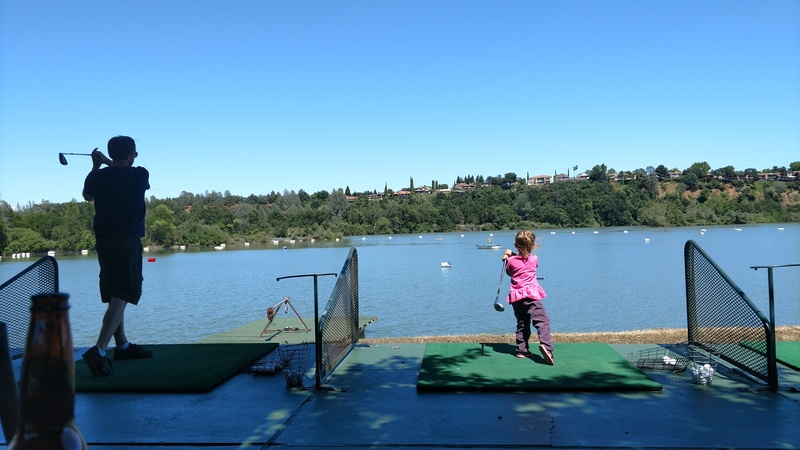 We had so much fun there and ended up staying the afternoon hitting balls into the water!! The views were amazing! Anyhow we managed to pack everything up and leave Redding California around 10 or 11 in the morning. 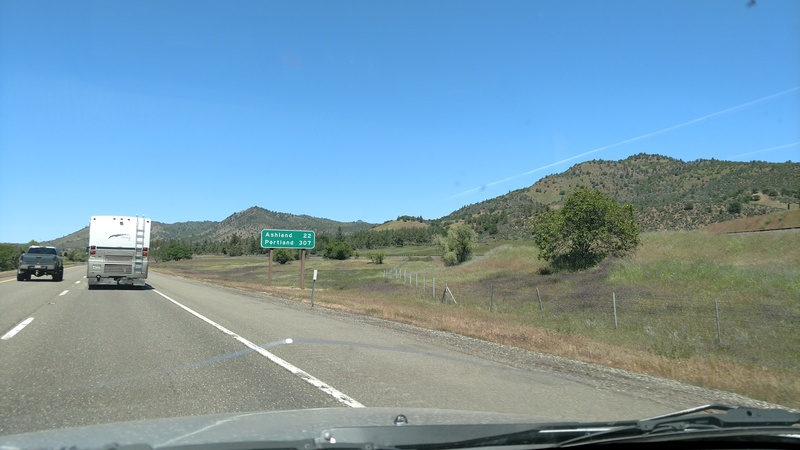 The drive up north was extremely hilly and we knew there were some steep grades ahead so we decided to drive separately. 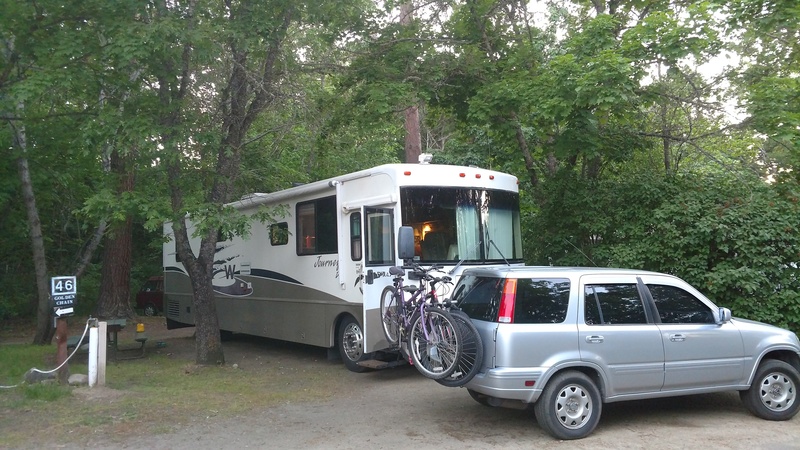 So of course Scott drove the RV and I drove Annika in our Honda CRV. the drive up was gorgeous here are a couple of shots of the scenery changes along the way. 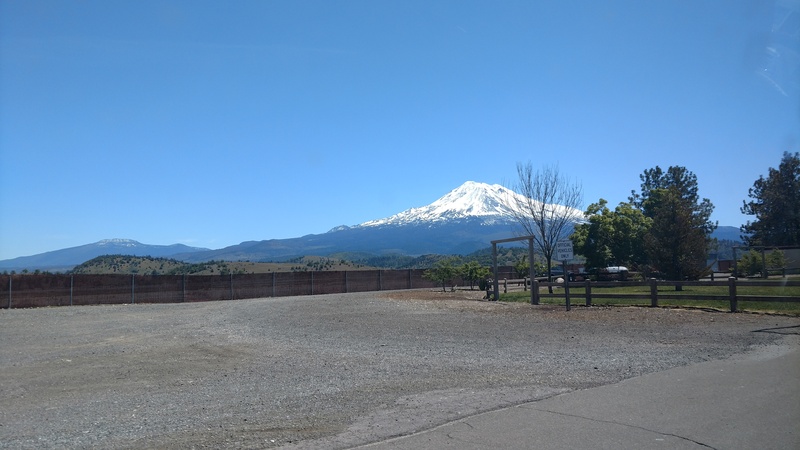 The Siskiyou Summit and Mt Shasta were beautiful!! 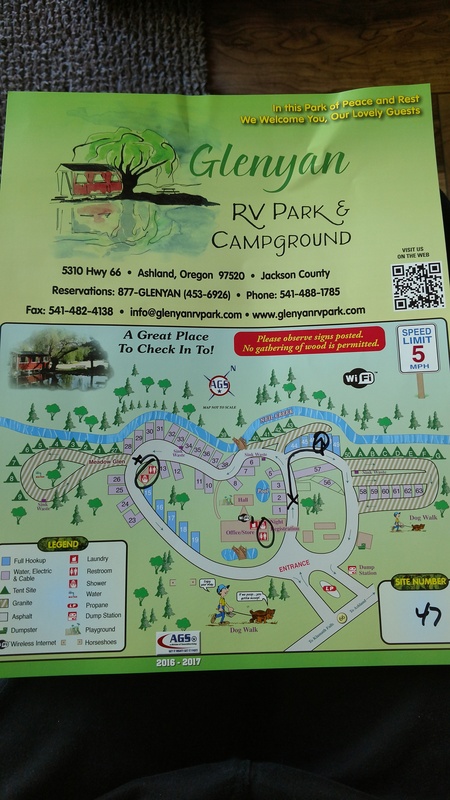 We have reservations at glenyan RV Park which is about 10 minutes outside of downtown Ashland. 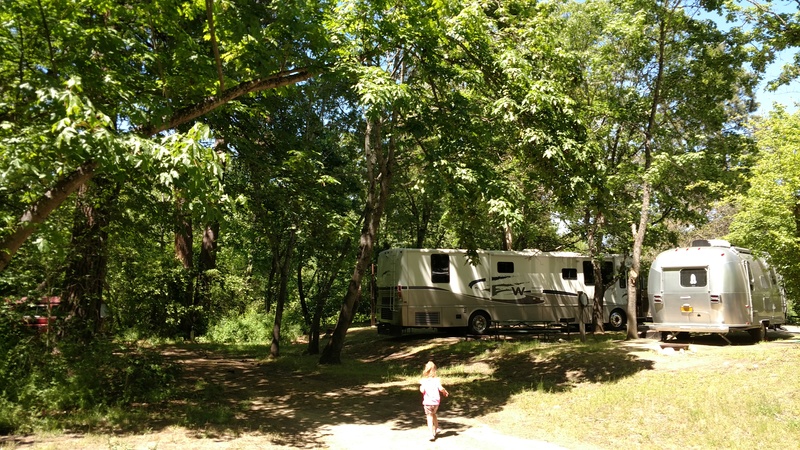 When we pulled into the RV park we were amazed at the trees the running water and the beauty of the park. 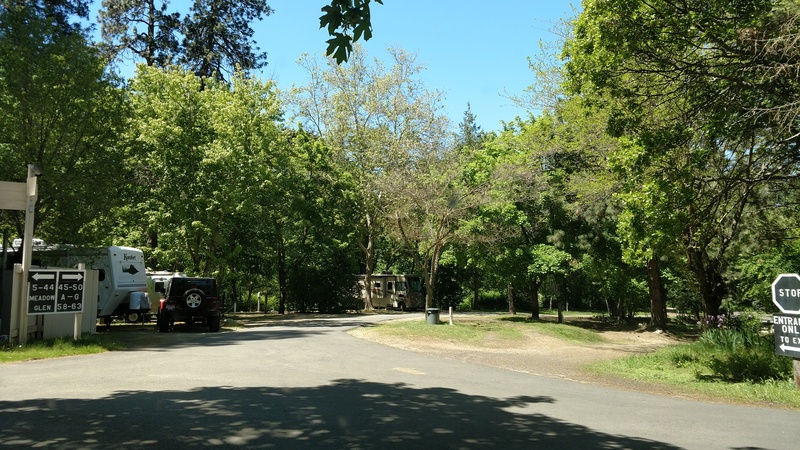 It looks like the spaces are pretty far apart as well and the park is not overcrowded.. 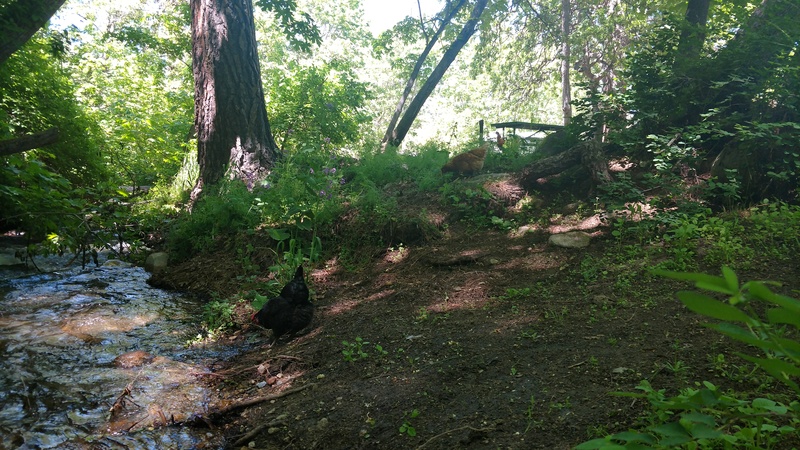 Here is our spot. 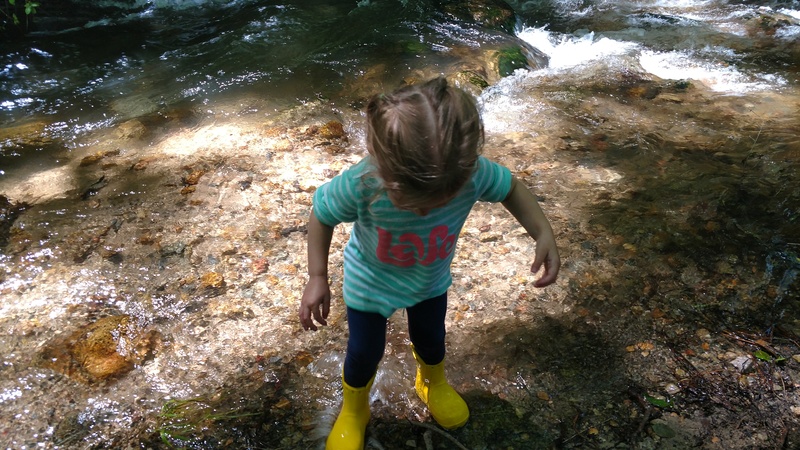 We are super close to the creek and Annika has been enjoying playing in it. 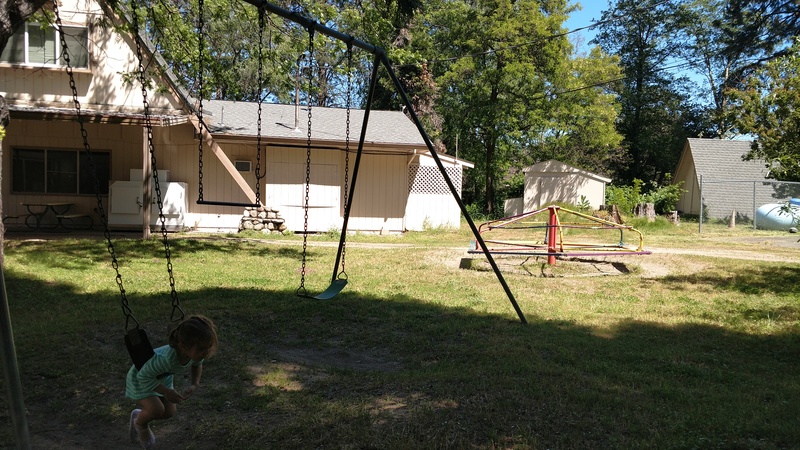 The RV park also has chickens that roam the property, basketball court, swings and a merry go round. 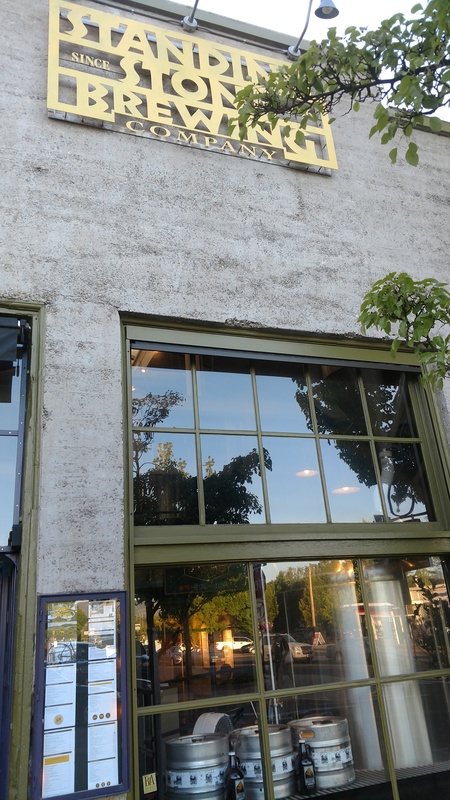 … There’s so much to do here… Oh not to mention they also have a pond and a general store. 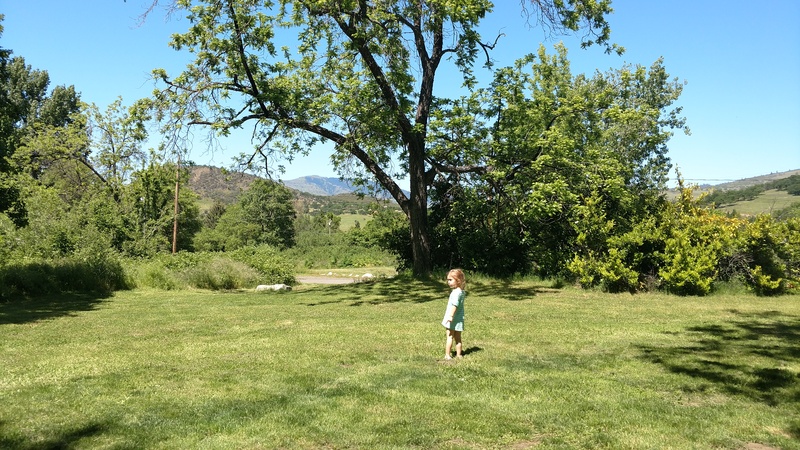 Tons of green grass for Annika to play on and fun bridges that cross over Neil Creek!! And naturally after playing we decided to go hit up a dreary. 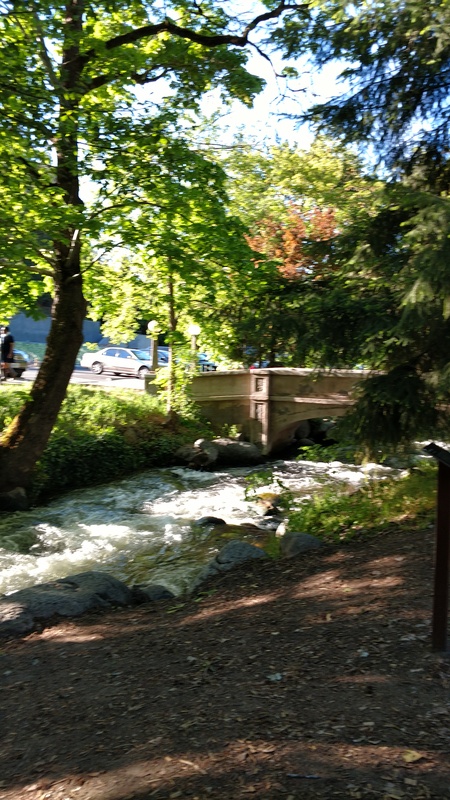 We had found Standing Stone Brewing very close to Lithia Park and decided to walk on over due to the awesome beer list they had! 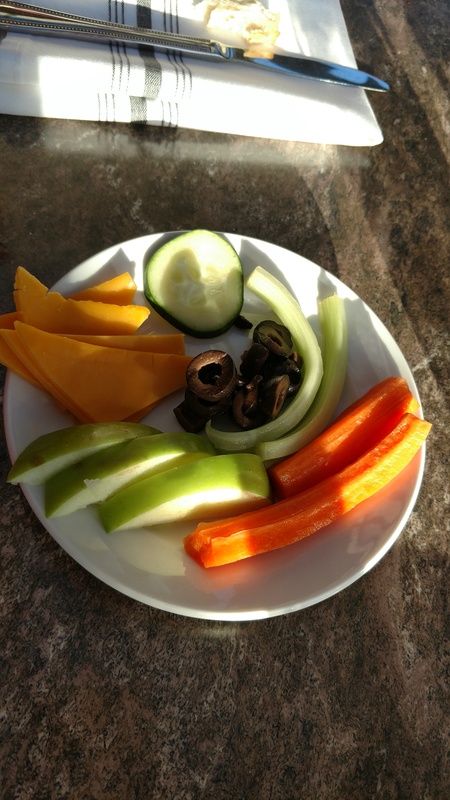 I was really happy about this place because they had a kids menu with a $3 fruit and veggie tray option. I wish every single bar on Earth have this because it’s super good for kids to snack on and cheap for us to get! How awesome is this? 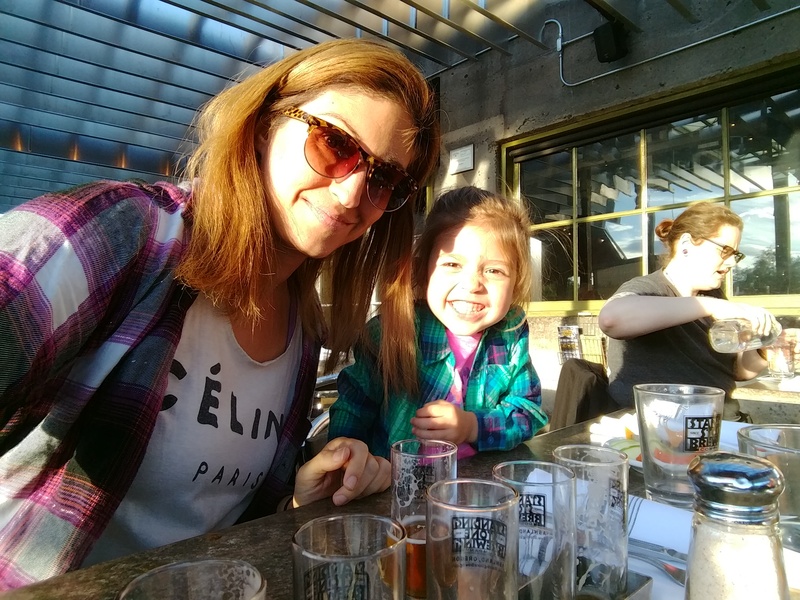 They had enough room on their patio that we got to sit outside in the sun and enjoy the sunset. 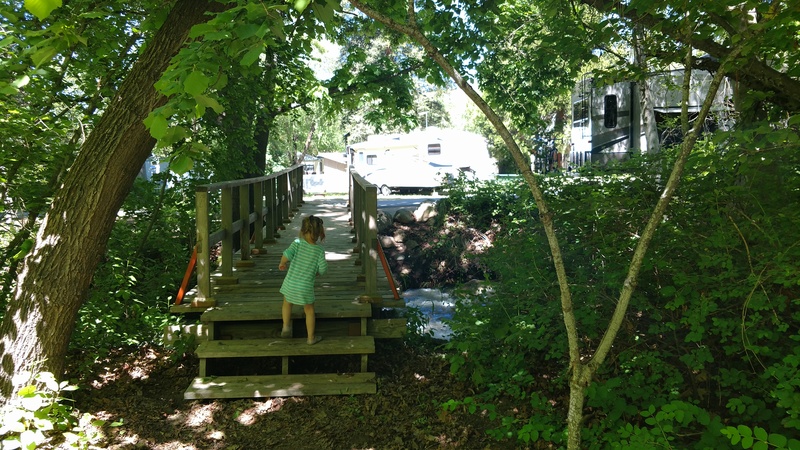 The following day we spent mostly at the RV park playing at the swing set and basketball courts and just walking around following the chickens and Crossing Bridges. The weather has been phenomenal just about 70 degrees with the light Cool Breeze. I love it so much here and don’t want to leave but I’m looking forward to seeing friends and Portland. 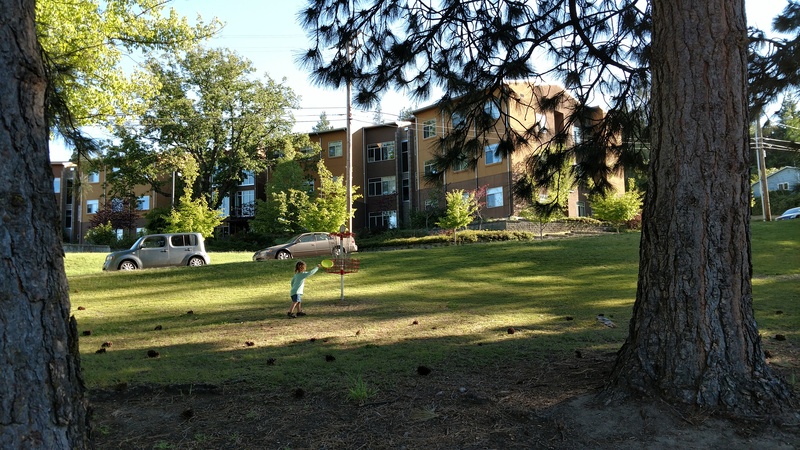 Scott and I love to disc golf so we looked up the course and found one on Southern Oregon University campus. 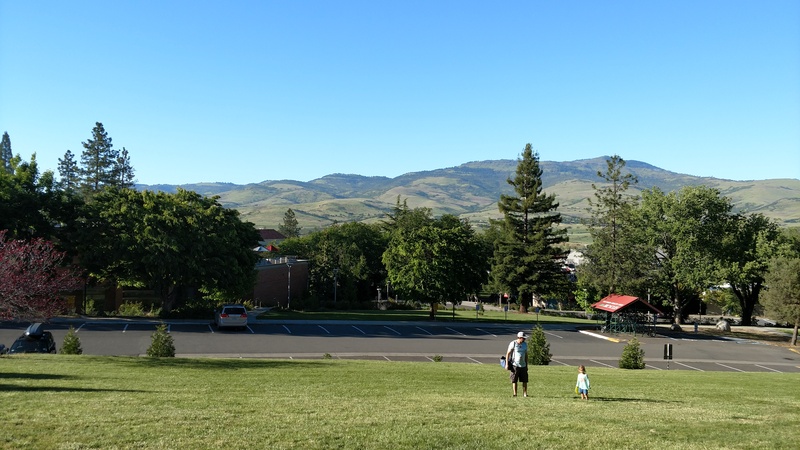 We ended up playing about 9 holes and had a lot of fun with a beautiful view overlooking Ashland. This morning we got up early and decided to head to the local farmer’s market. 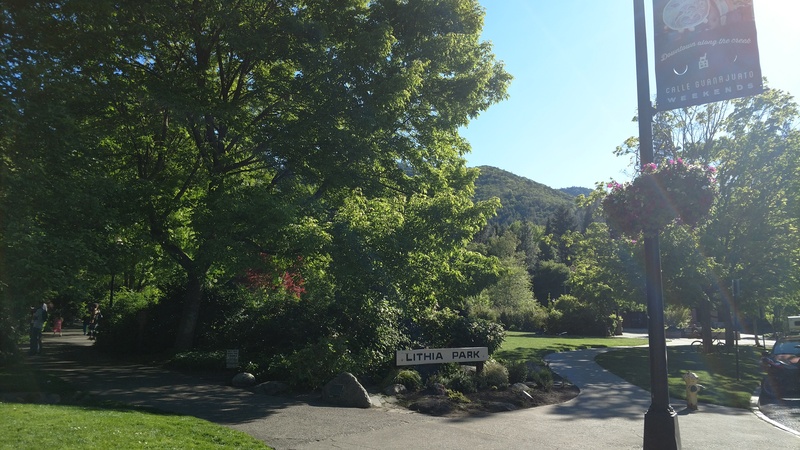 We walked all around Ashland and took Annika back to Lithia Park for a second time. You can bet she’s asleep right now after all the playing she did. 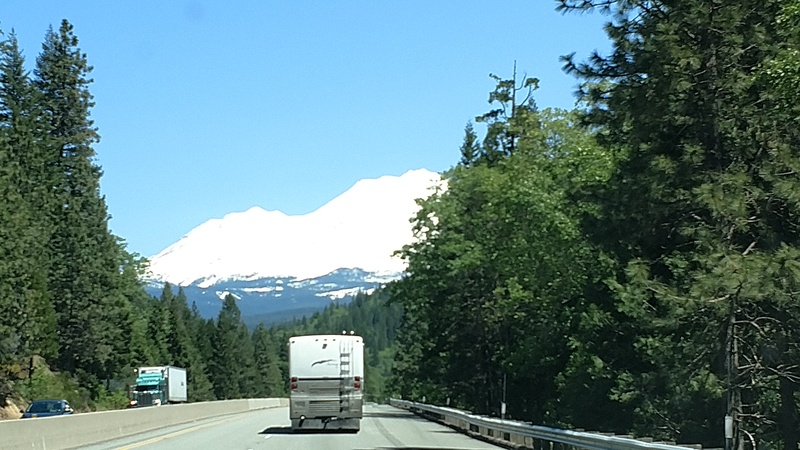 We have a couple more days in Ashland and then up to Portland we go!!! 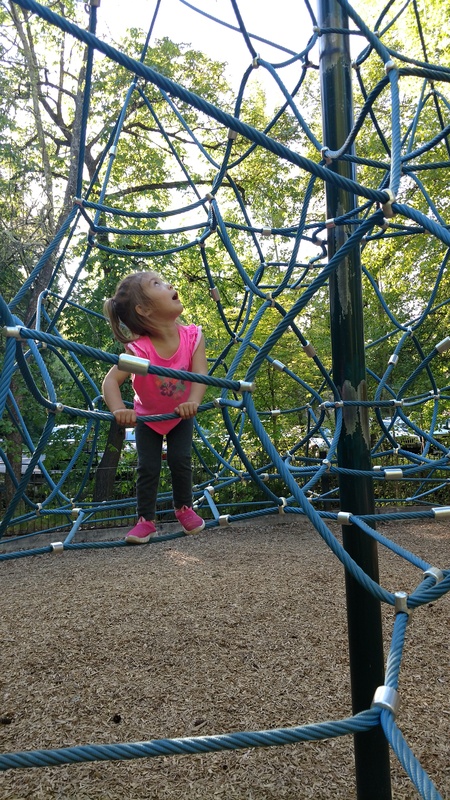 An adventurous family of three...did I mention we are traveling across the United States in a 40' motorhome with a toddler? Where are we now? Ocean-side or in the desert? 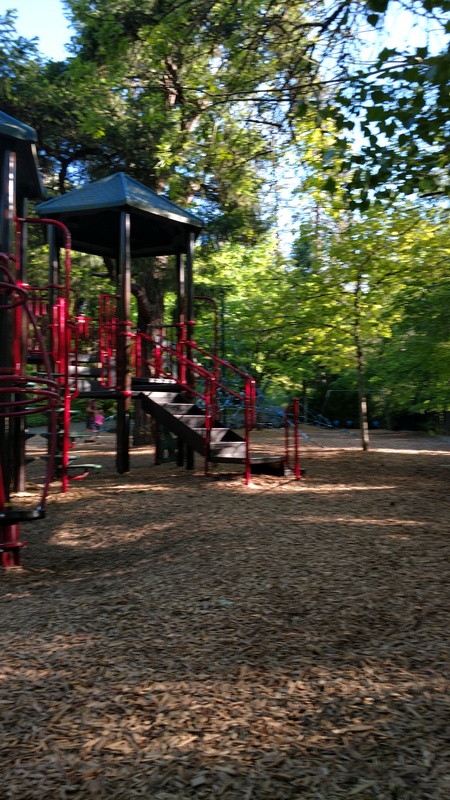 In a park or hiking mountains?